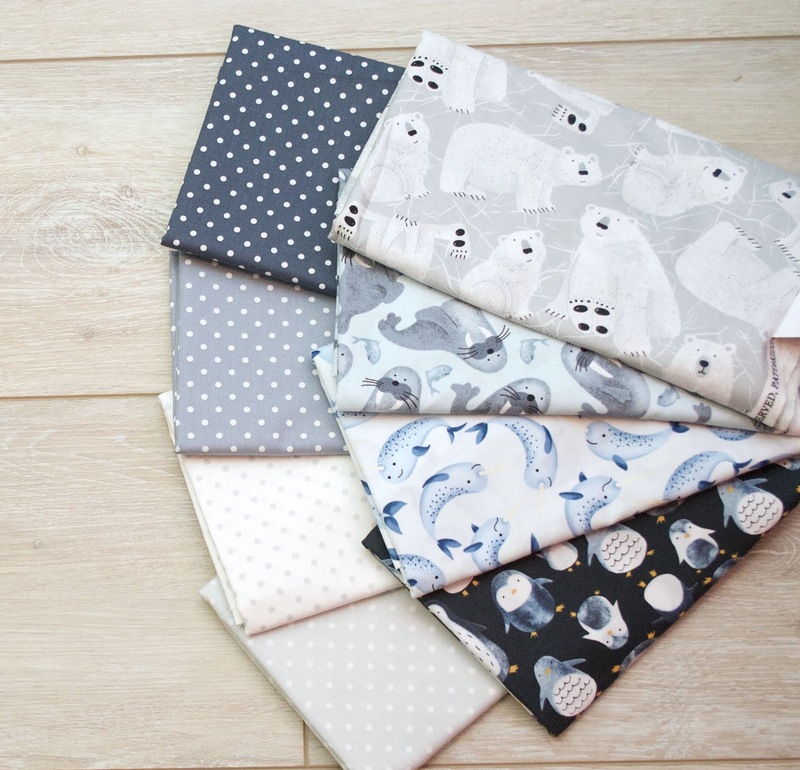 Welcome back to Team Timeless, an ongoing series of fun tutorials brought to you by some of our favorite designers! 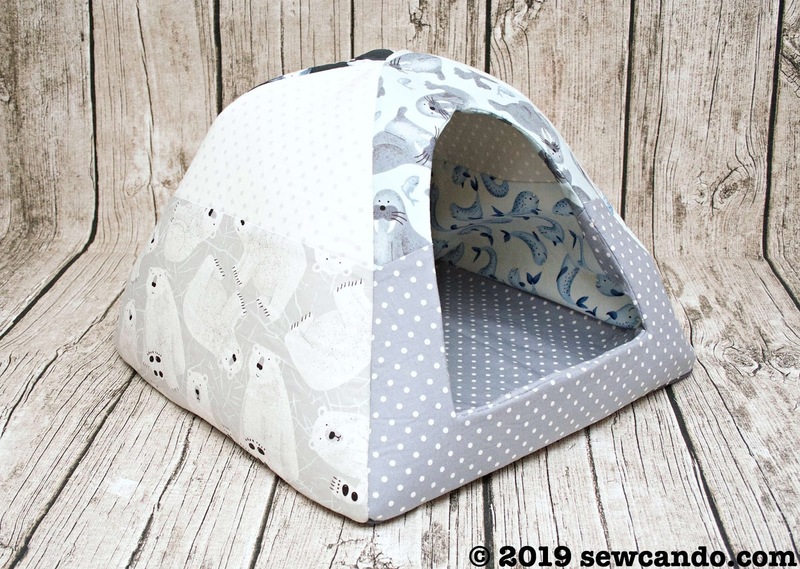 Cheryl Bush joins us this month with this perfect little winter home for pets and toys. Follow along to make one of your own! 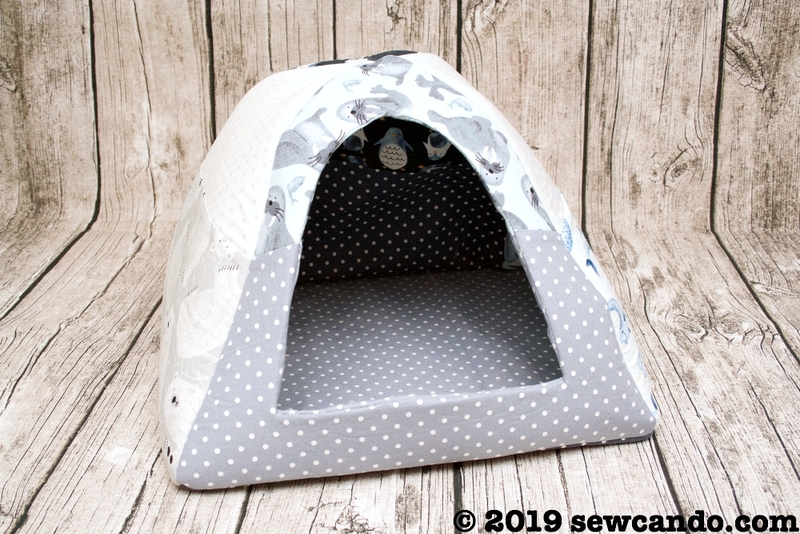 I’m excited to start the new year with a fun new project pattern: a Fun Igloo Pet House! 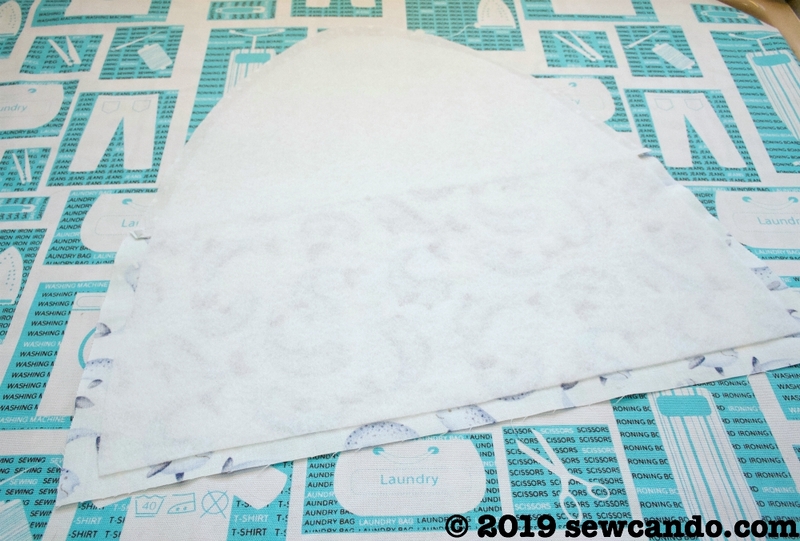 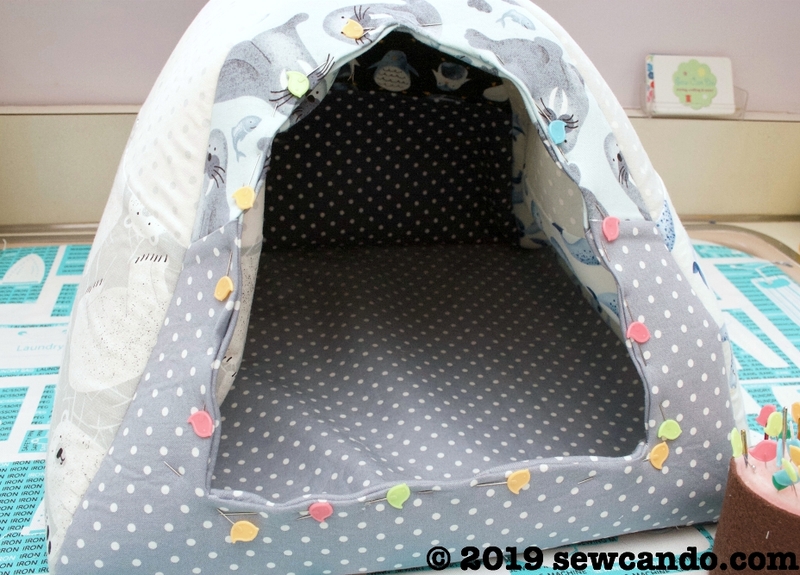 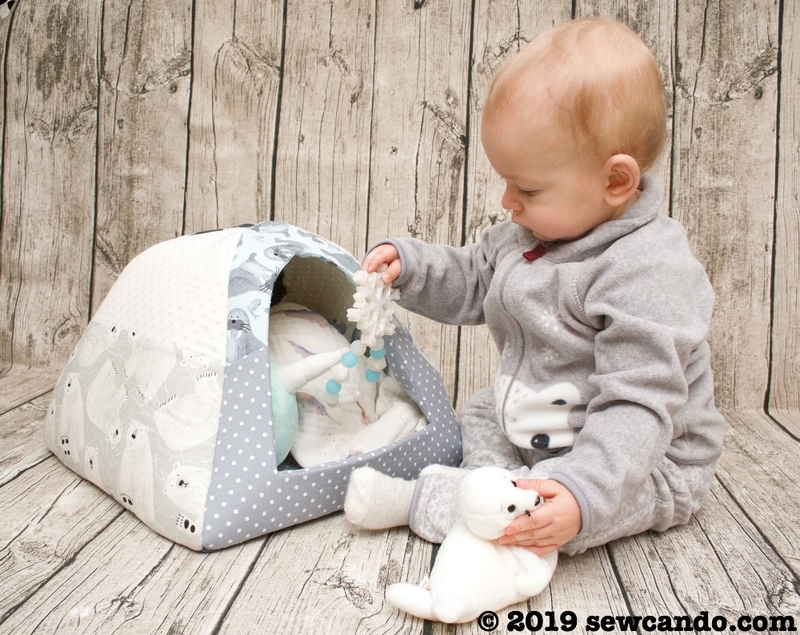 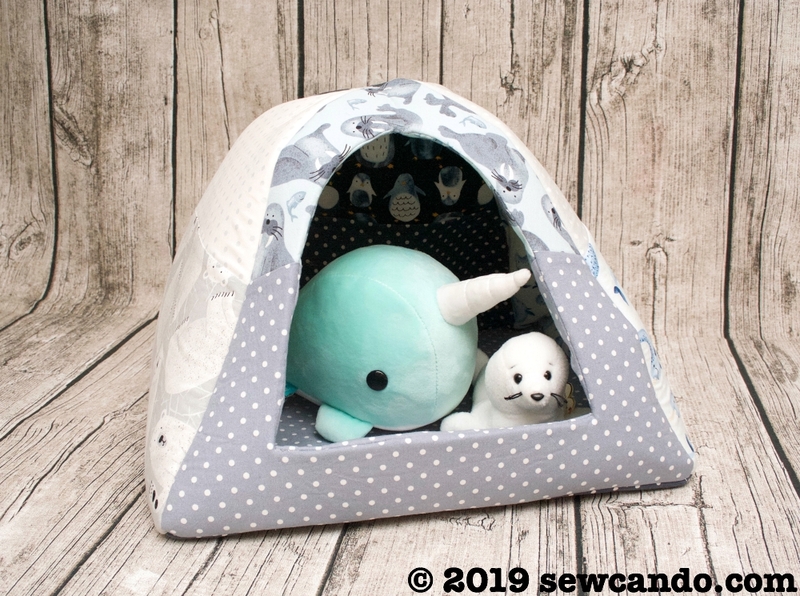 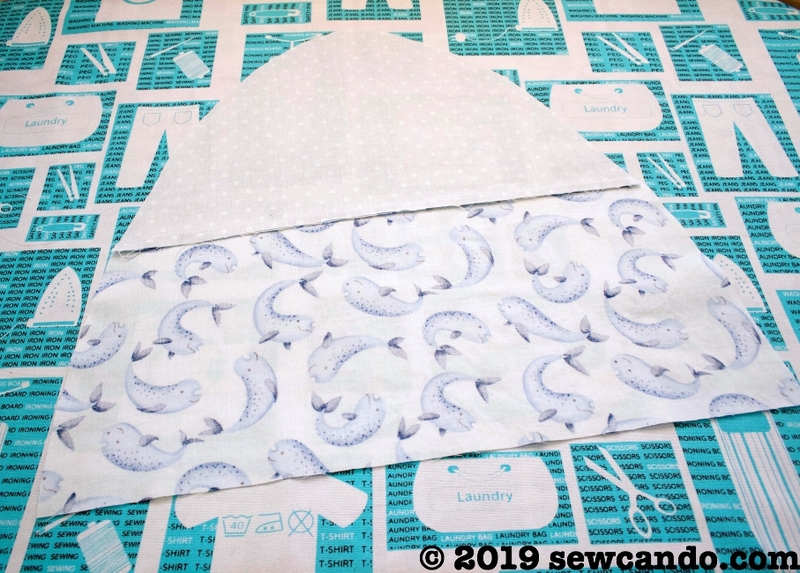 With a little imagination, and a bit of fusible foam, these chilly weather themed fabrics from the Polar Opposites collection have been transformed into a fun and functional little igloo that makes an ideal house for cats & small dogs. 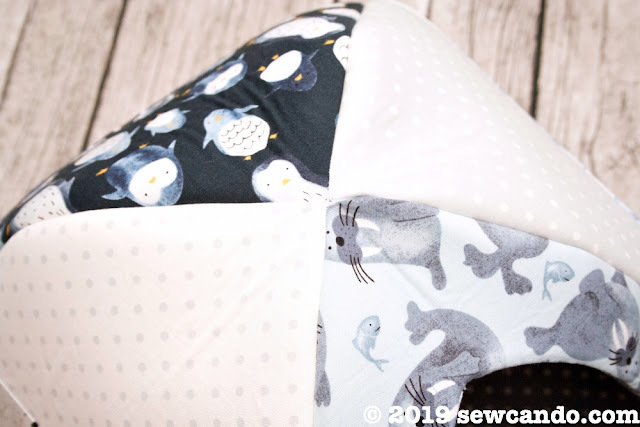 These adorable new fabrics on each side are perfectly suited for an igloo (and make it extra fun!). 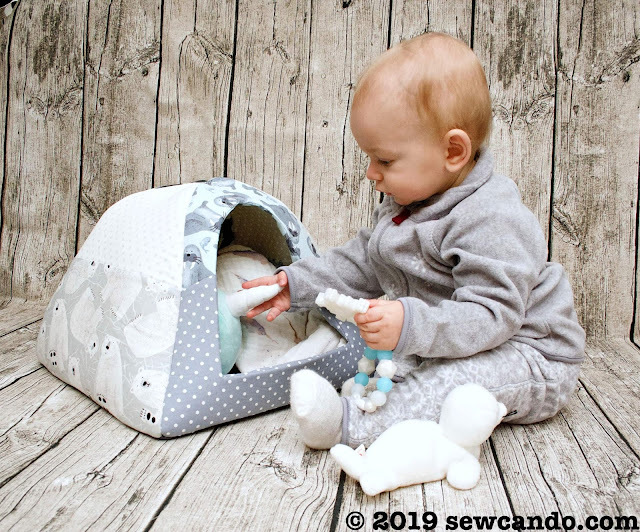 The soft blue and grey shades are a fun cool neutrals. 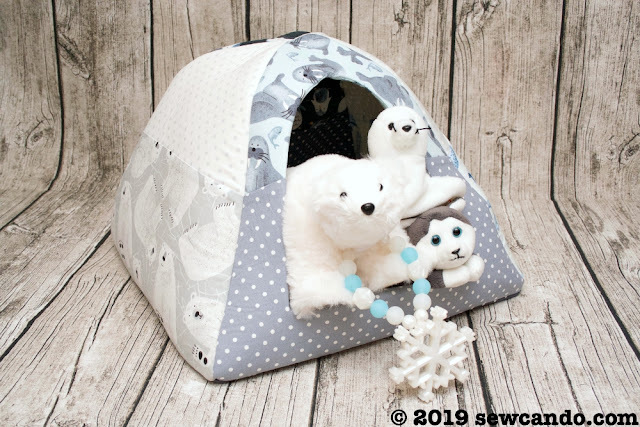 The tiny polka dots pair sweetly with the whimsical arctic & antarctic animals. 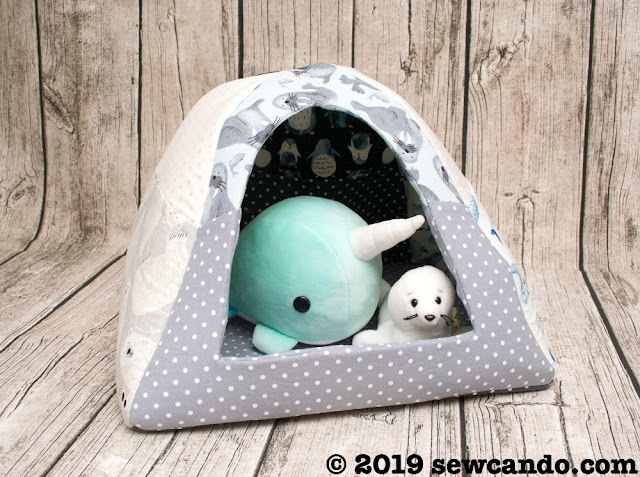 Adorable walruses, polar bears, penguins, and everyone’s favorite, the narwhal! Now let’s get to the making! 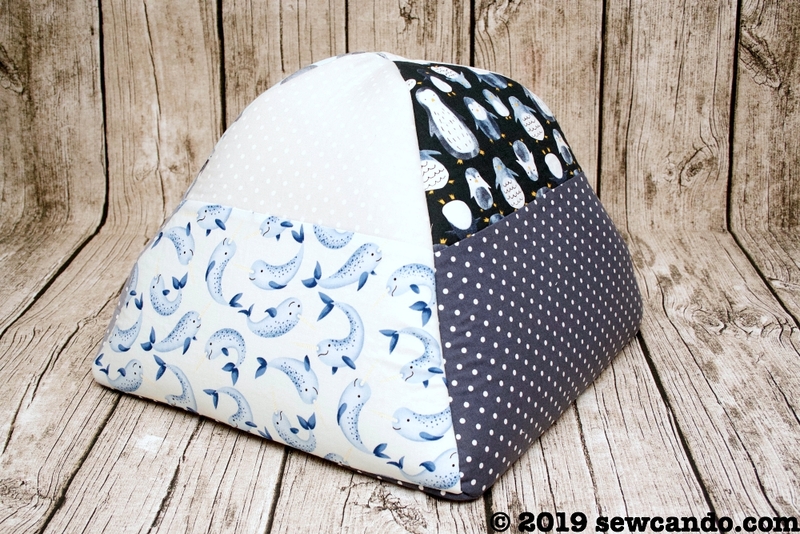 Download my free pattern pieces. 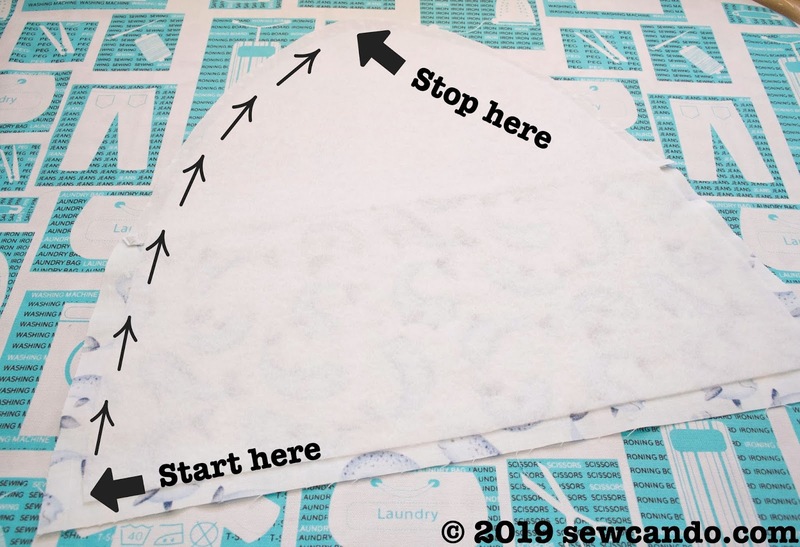 Set printer to actual size, then print and check the square inch on the page to be sure your templates printed correctly. 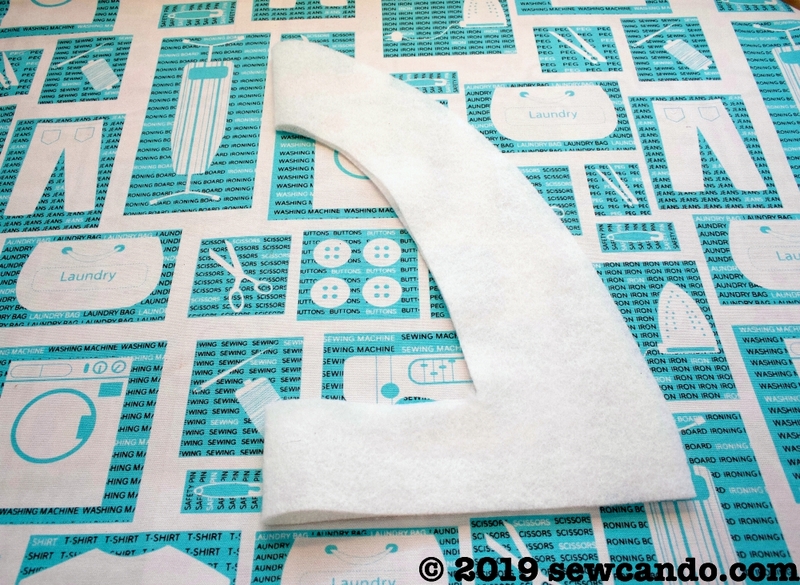 Cut out and tape base halves together per the instructions. 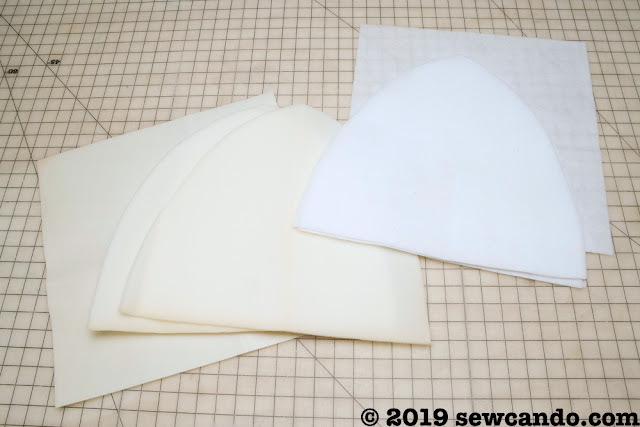 – Cut a 14 1/2″ x 14 1/2″ square from Dot-C1820-Steel and Dot-C1820-Smoke for the base pieces (this includes the seam allowance). 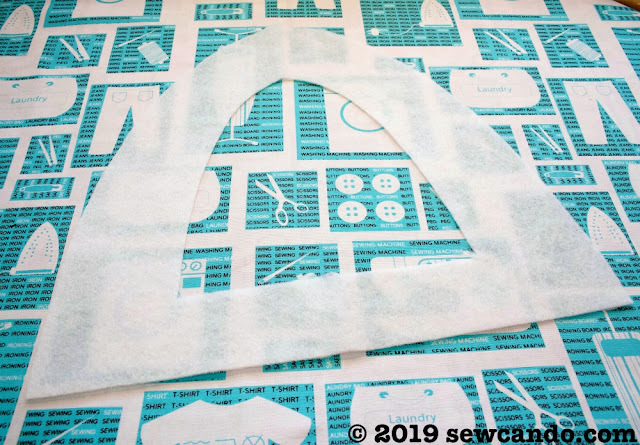 Put top and base paper pattern pieces together and tape along center to make a full side pattern. Cut out the stabilizers, but do not add any seam allowances. Take one side piece each from the fleece and foam, fold in half widthwise and cut out the front opening space along the pattern’s center cutline. 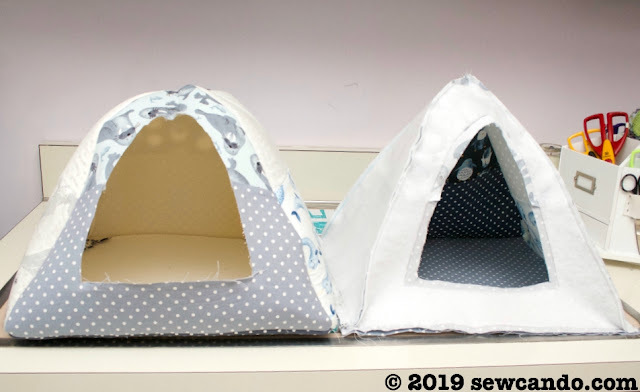 There will now be 2 sets of 4 igloo sides. 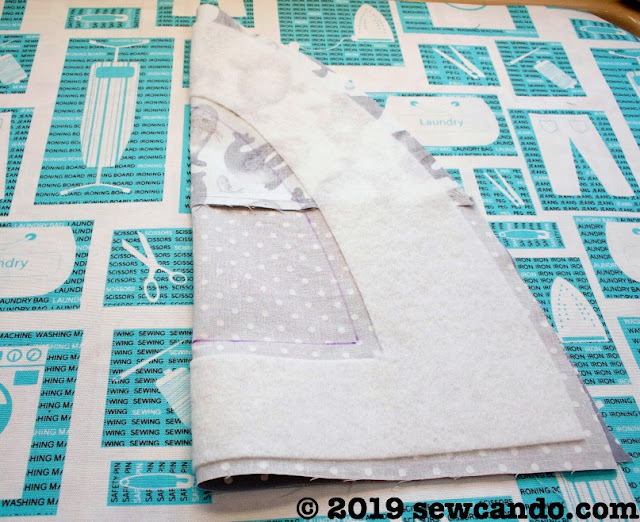 Press seams flat to one side. 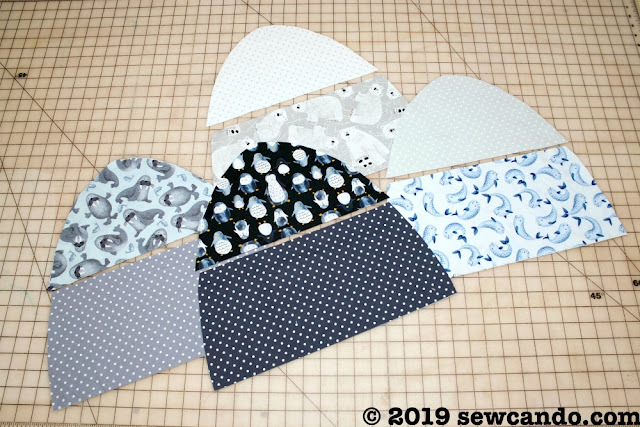 Separate the pieces into two matching sets. 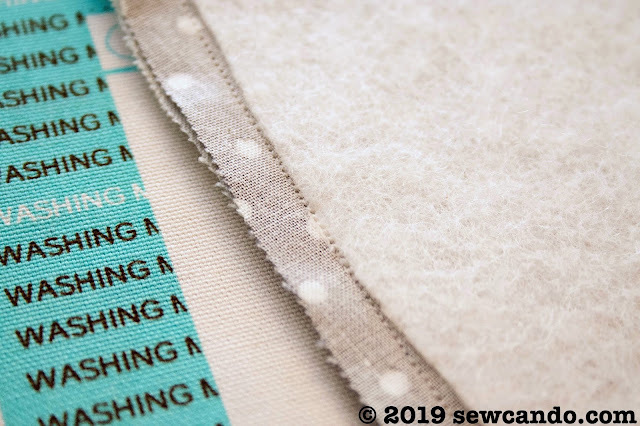 Fuse the fleece to the wrong side of one set according to the manufacturers instructions, fuse the foam to the other, leaving the 1/4″ fabric seam allowance around all sides. Cut out the opening area, using the stabilizer as your guide, leaving a 1/2″ allowance. 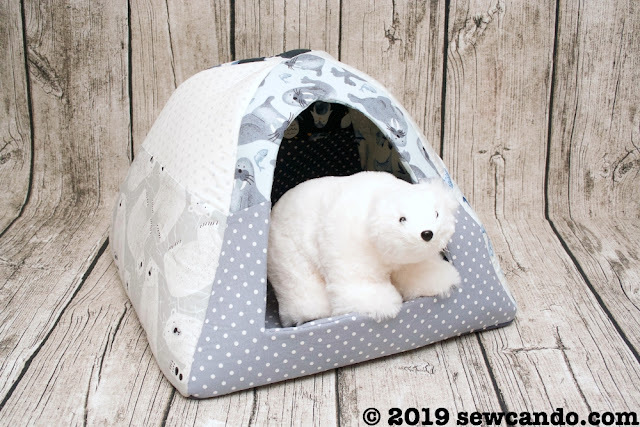 Start with two igloo outer sides. With right sides facing, pin, then stitch together with a 1/4″ seam allowance. 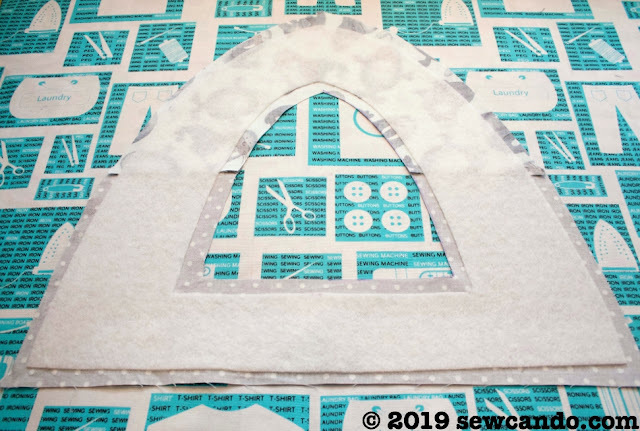 Start where the stabilizer begins at the bottom and stop stitching where the stabilizer ends at the point of the igloo. Start and stop stitching 1/4″ from each end to make it easier to pivot and repeat for the remaining three sides. Carefully clip 1/4″ into into the three corners of the fabric of the opening triangle. 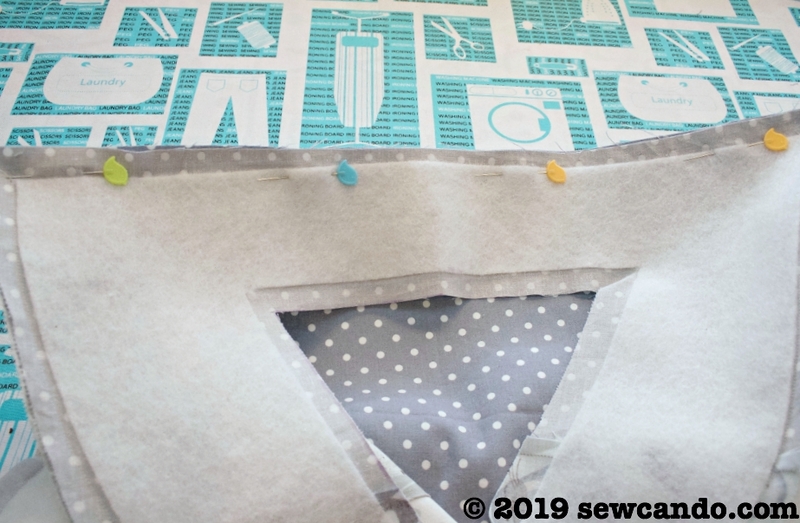 Fold fabric edges inward and pin all the way around. 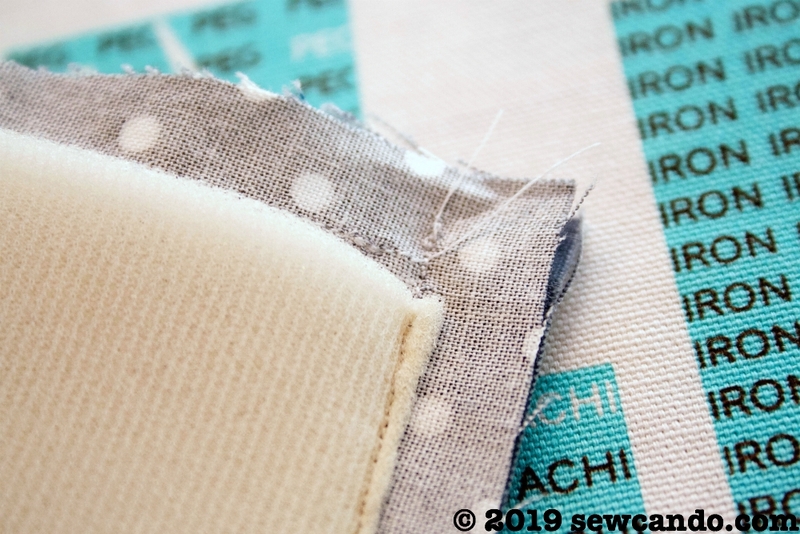 Slipstitch the folded edges together by hand.